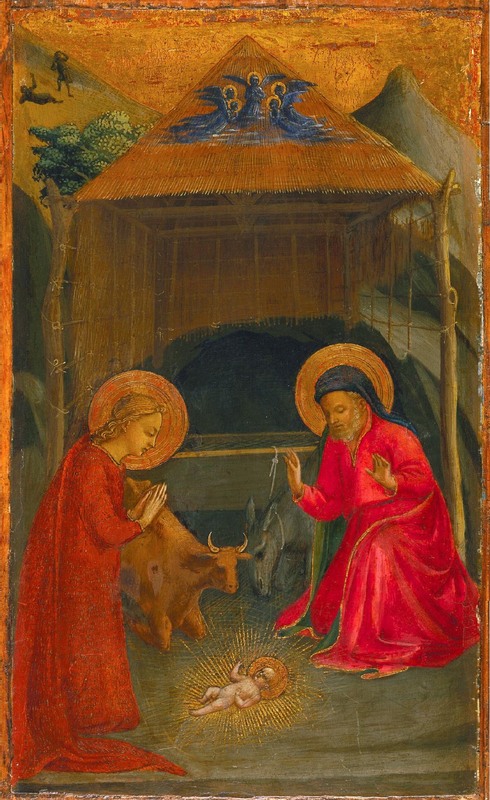 Based on its size, shape, and subject, Boskovits suggested that the Minneapolis Nativity probably was painted as the wing of a portable triptych - possibly the same one from which the Annunciation pinnacles (cat. 16 C, D) in the Yale University Art Gallery were excised. Although it can now be shown that the Yale pinnacles came from a different complex, the assumption that the Minneapolis Nativity probably was once the wing of a small triptych seems likely to be correct. The panel retains its original thickness and bears no traces of hinges at either side, but the partial remains of a barb along the left and right edges of the paint surface coupled with visible evidence of trimming along the lateral edges indicate that an engaged frame has been cut away, and any hinges that might have secured the panel to another one would have been affixed to this frame molding. The bottom edge of the paint surface, while damaged, seems also to retain partial remnants of a barb, implying that the composition is largely complete in this direction as well. There is extensive damage and repair in the gilding across the top of the picture surface, however, eliminating any evidence of the possible vertical extension of the picture field. The logical point of comparison for evaluating the composition of the Minneapolis Nativity, as John Pope-Hennessy contended, is the Nativity scene on the Annunziata Silver Chest (fig. 58). 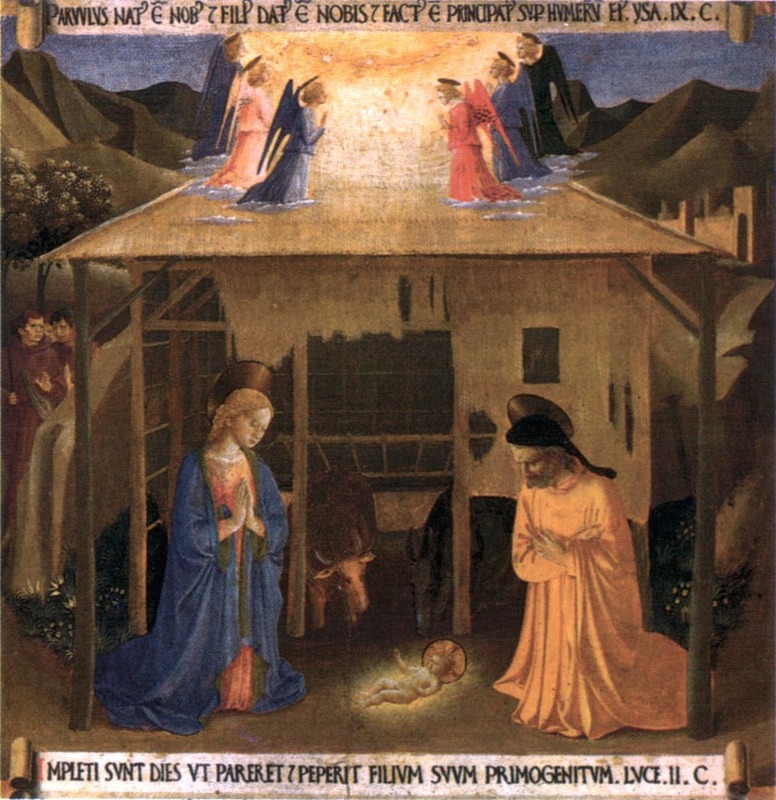 Both compositions are centralized around the recumbent form of the Christ Child on the ground beneath the projecting straw roof of a rustic shed, with the Virgin and Saint Joseph symmetrically disposed on either side of him. In both scenes, a glory of angels hovers at the top, over the roof of the shed and directly above the Christ Child, and a hilly landscape completes the visible portion of the scene in the middle ground and the far distance, at the upper left and right. As the Silver Chest Nativity is more nearly square in format than the pronouncedly vertical composition in Minneapolis, it includes the figures of the shepherds appearing from around the shoulder of an outcropping of rock behind the Virgin at the left, whereas the Minneapolis scene alludes to their presence only through a miniaturist vignette in the distant back-ground, in the upper-left corner. The spatial structure of the scene on the Silver Chest, based on a semi-circular arrangement of the figures within a centrally foreshortened cube, is much more sophisticated than that of the Minneapolis Nativity, where the figures are disposed along a diagonal vaguely situated in front of a similar cube. This difference, however, does not imply that the latter is a weak derivation of the former; it is typical of the development of Angelico's interest in illusionistic pictorial space, before and after his initial exposure to the experiments of Masaccio and Brunelleschi on the walls of the Brancacci Chapel. Such naturalistic details in the Minneapolis Nativity as the rope ties securing the ends of the projecting canes that define the sides of the shed, as well as the studied irregularity of those canes and of the rough - cut supporting poles to which they are attached, can only be ascribed to Angelico himself - and, specifically, to a moment close in time to the date of the predella of the San Domenico Annunciation altarpiece (now in the Museo del Prado). 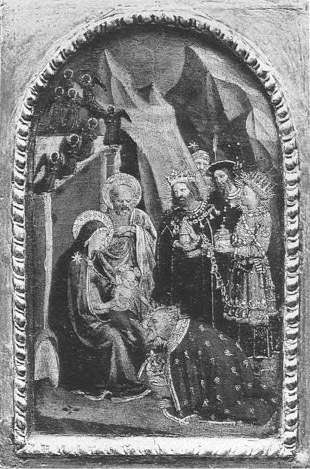 A comparison of the Minneapolis Nativity with the scene of The Adoration of the Magi on the predella of the San Domenico Annunciation (fig. 59) reveals a nearly identical compositional plan in both, although elaborated in a horizontal format in the case of the Adoration. The figure types in the two paintings are closely related, as is the spatial structure and the microscopic attention to detail in depicting the setting. An argument has been made for dating the Annunciation altarpiece to 1425 — a date that seems accurate for the Minneapolis Nativity as well. 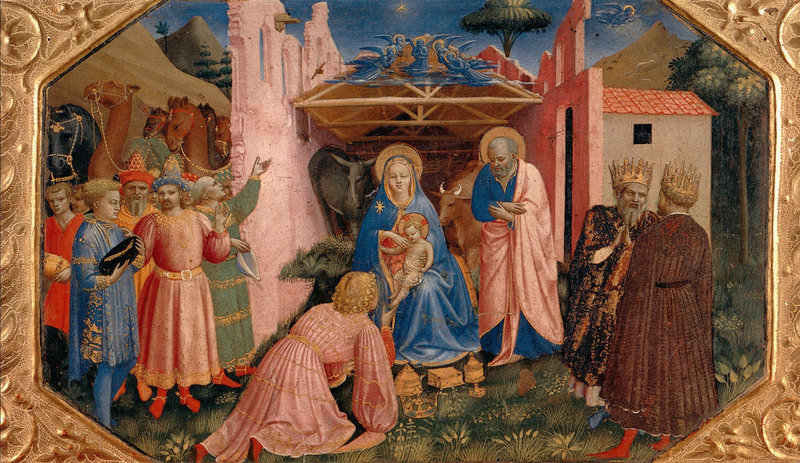 Shortly afterward, undoubtedly in response to Masaccio's accomplishments in the Carmine, Fra Angelico's staging of narrative becomes more simplified: still unremittingly naturalistic, but purged of the dense patterning and detail that may well have been inspired by the unveiling at Santa Trinita in 1423 of Gentile da Fabriano's Adoration of the Magi altarpiece for Palla Strozzi. 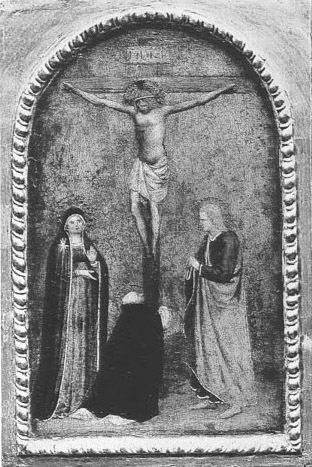 In paintings postdating 1426, such as the five scenes from the legend of Saint Francis from the Franciscan altarpiece of 1429 (cat. 24) or the five panels of the Saint Lucy predella (cat. 25), the artist employs some of the same perspectival devices he experimented with here but they are realized with greater subtlety. His figures are grander, more statuesque, and more successfully integrated into the architectural spaces they occupy rather than disposed before them. All this must be seen as a direct response to Masaccio's influence — a response that would be tempered in the following decade by a gradual but increasinlgy mature resumption of his own intuitive sense of descriptive naturalism. This Adoration - which was part of a diptych that included a much-damaged Crucifixion - must date from only a year or two earlier than the Prado altarpiece and the Minneapolis Nativity. 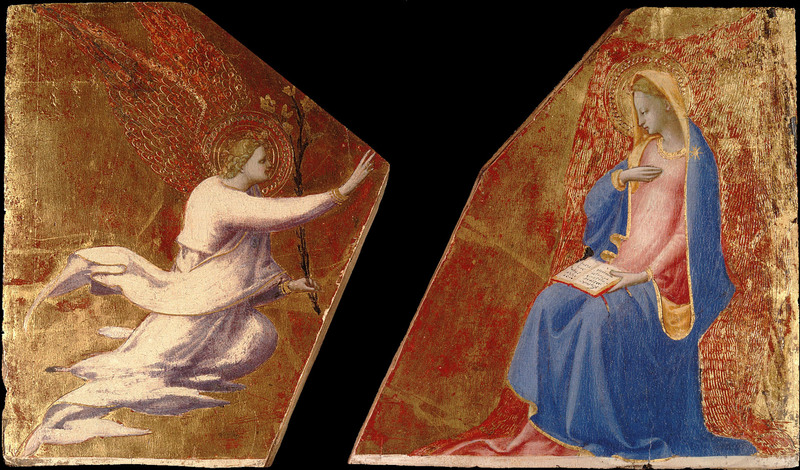 It is possible that the Minneapolis painting similarly was intended to be part of a diptych, rather than the wing of a folding triptych, but until other panels are identified that might have been associated with it in a single structure, the question must remain unresolved. (*1). Schottmiiller 1924, p. 242. (*2). Collobi-Ragghianti 1950b, p. 463. (*3). Pope-Hennessy 1974, p. 229:"the panel, though influenced by Angelico ... originates outside his shop. "The painting is illustrated as figure 92, alongside the Nativity by Zanobi Strozzi in The Metropolitan Museum of Art (cat. 51), but the captions for the two paintings are reversed. (*4). Boskovits 1976a, pp. 41 , 43,53 n. 45; Bonsanti 1998, p. 117; Everett Fahy (1980; 1996) and Carl Strehlke (1992), in notes in the archives of The Minneapolis Institute of Arts. (*5). Annotation on photographs in the Richard Offner Photo Archive at the Institute of Fine Arts, New York University.